Mike Swanson joined Double U in August 2014 to head up the repairs and service area. He is quickly became an expert in Garmin and Dog Products, and has since been promoted to manage the team and operations for Double U. He loves all outdoor activities including hiking, hunting and camping. He also enjoys taking his wife, Tammy, daughter and twin boys out hunting with him. He spends his summers coaching his kids’ soccer teams and also plays soccer himself. He has a yellow Labrador named Tucker. Mike has helped speed up our shipping and Service at Double U. In the first Year Mike has successfully shortened the Turn around time for service repairs taking 3-5 days to 1 day. Mike has stepped up to direct the team to handle all the nessisary functions of Operations, from Phone support, Packaging and Shipping orders quickly, as well as Serive Repairs. 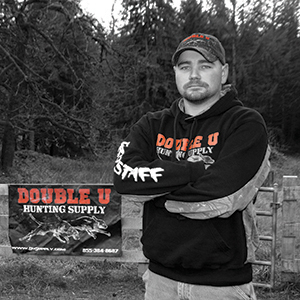 We are proud to have Mike on the Double U team dedicated to keeping you and your dogs in the woods hunting. No other company can compete with the dedication that Double U and Mike and his team offer. If you have an issue or problem with your order or service, give us a call and ask for Mike.